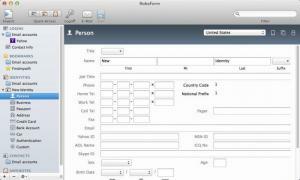 RoboForm allows you to save your usernames, passwords and other important information in a secure database. This means that you don't have to remember the login credentials for all your accounts. You only need to remember one master password to access your database. The best part is that RoboForm is quite easy to use, regardless of what operation you wish to perform. The application will ask you to create a master password, when you run it for the first time. This is the password you have to remember at all costs, because there is no way to recover it if you forget it. If you have this password memorized, you may forget all other passwords. The application allows you to save login credentials, bookmarks, contacts, identities and personal notes on separate pages, which can be accessed via navigation tabs, located on the left side of the user interface. RoboForm comes with browser plug-ins, for Safari, Google Chrome and others. These extensions make it quite easy to save new usernames and passwords. All you have to do is log into an account or just type them in the appropriate fields and select a Save option, which can be accessed through a new button, placed by the application on your browser's interface. If you have one or more online accounts stored in your database, you can use a series of options, located on a toolbar, to open their login page on your default browser, to fill in your username and password or to log into your account automatically, without typing anything. Alternatively, you can log into your accounts through the aforementioned browser plug-in, without bringing up the application's interface. Of course, the plug-in won't be active if you are not logged in RoboForm. Another useful feature is the possibility of saving identities. It gives you the possibility of filling in large sign-up sheets with a single click. You can store login credentials and other important information in a password-protected database. The application comes with auto-fill capabilities, so you can log into your accounts without typing anything. It can also auto-fill huge sign-up sheets. A password generator would be a welcome addition. Besides its highly effective security capabilities, RoboForm provides you with the means of using your login credentials and other information in a comfortable and elegant manner. You can download RoboForm free here.